Every block builds upon the other so the further along I get with these blocks the more complicated they are. 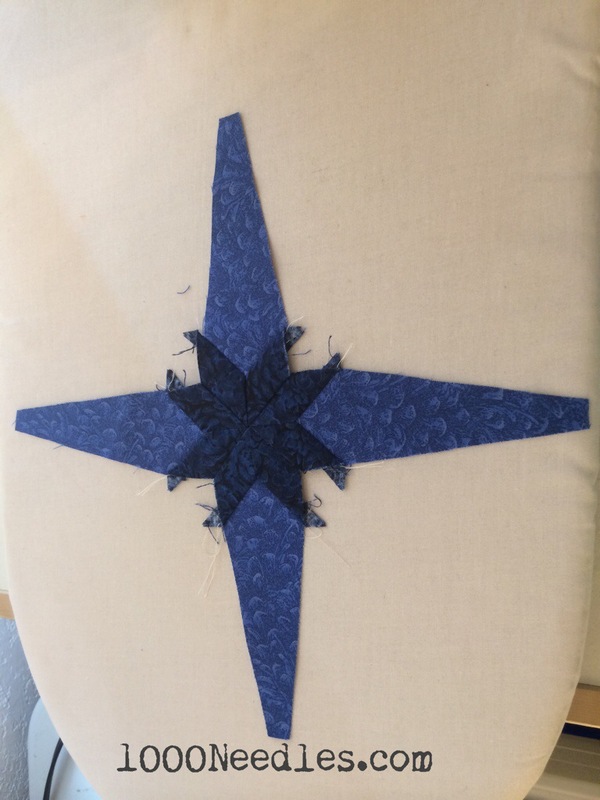 The middle is an eight pointed star so Y-Seams are very important. 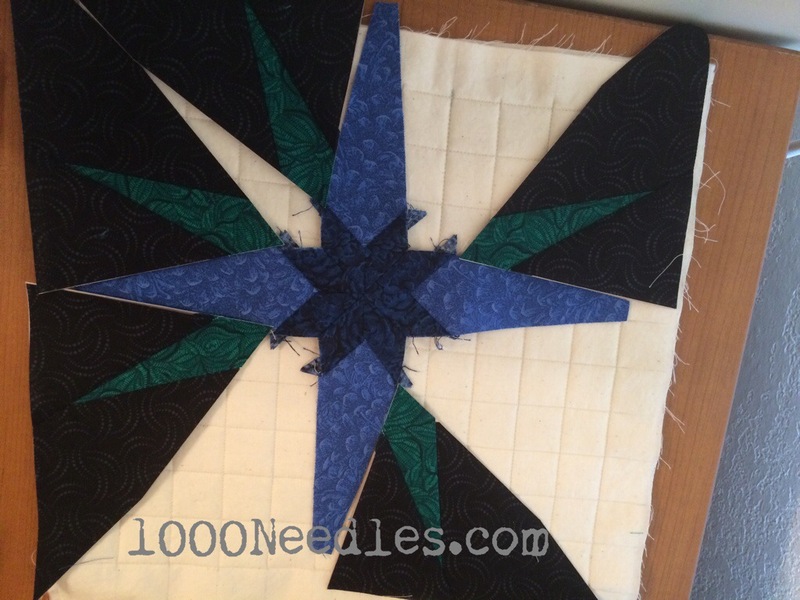 The dark blue center is small. These pieces are about 1.5 inches and were a pain to the points to match. I was really happy with the results. 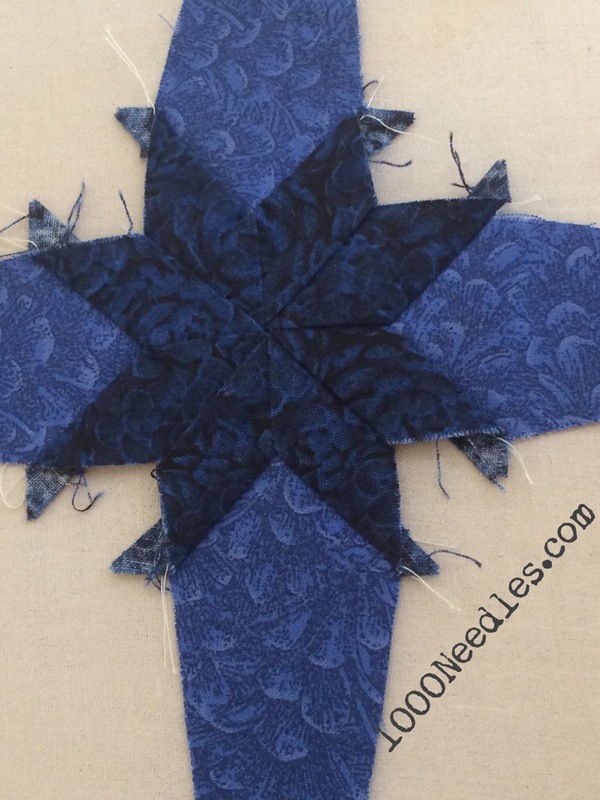 Then to attach the lighter blue triangle was another set of Y-Seams. 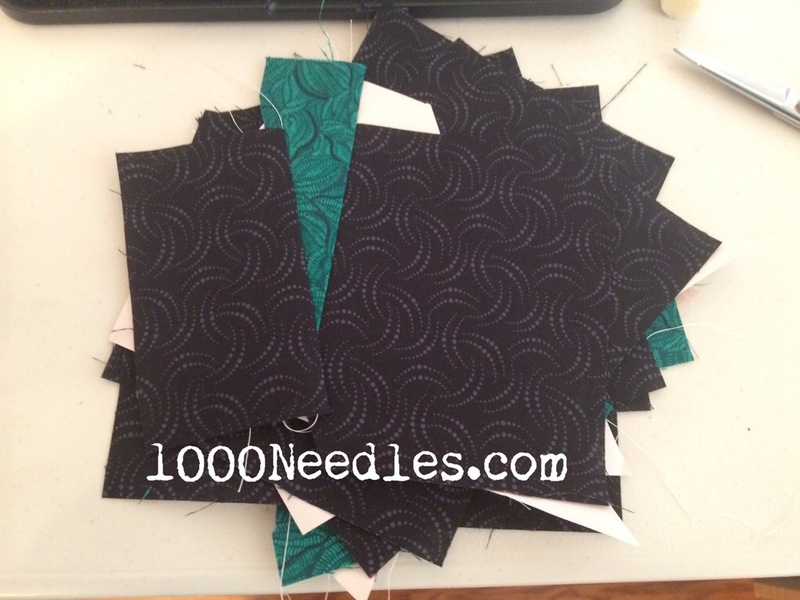 Every time I have to do Y-Seams I take a look at Crafty’s 2013 BOM class. I can’t remember which month it is but I’ve got it bookmarked to watch whenever I have to do them. Then step 2 had to do with getting the foundation pieces put together. 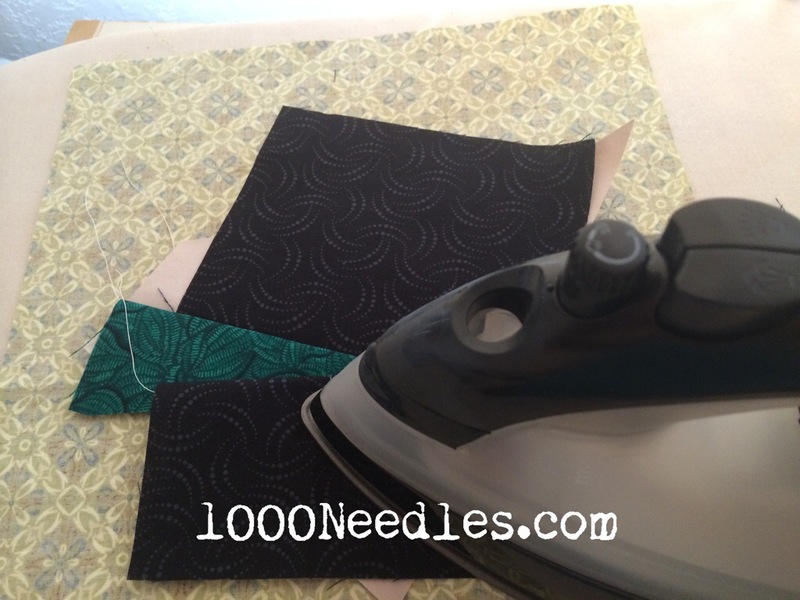 I had cut the fabric months ago while I was still in Fremont. I want to say May as I was caught up for a bit right before then. So getting the pieces stitched to the paper was pretty easy. 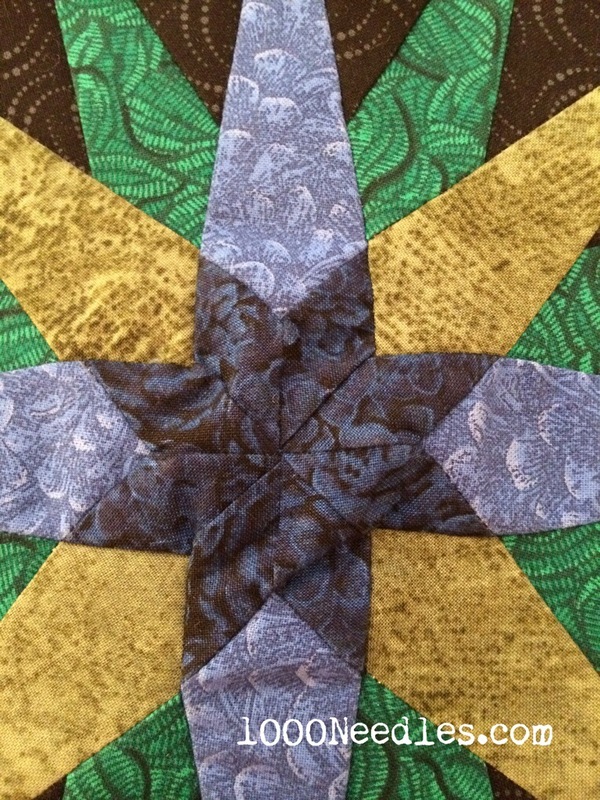 … and trimmed… I am getting better with Foundation piecing so that’s a good thing. 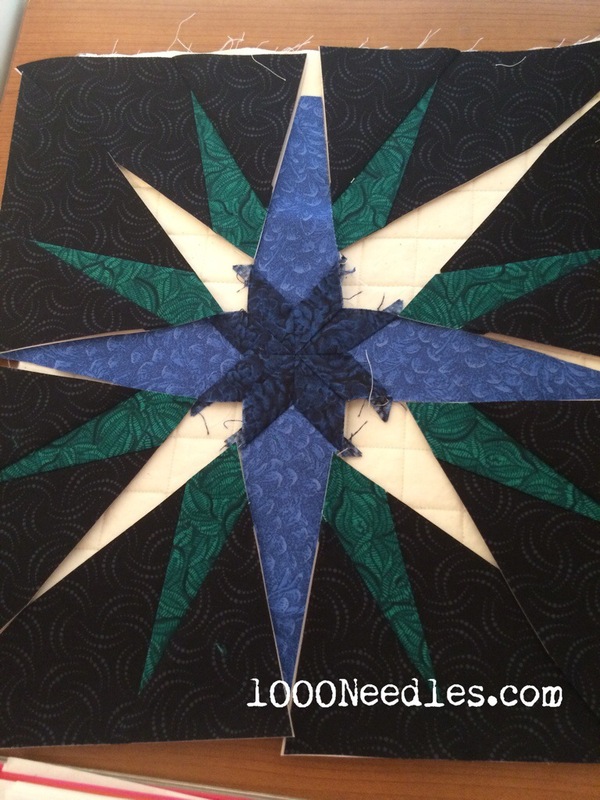 I laid out all the foundation pieced items with the star to see how it looked. 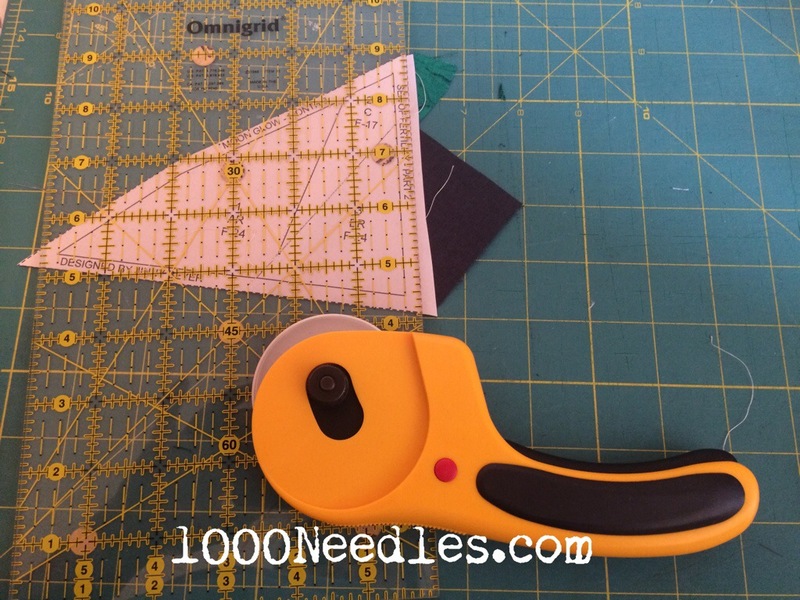 I love how foundation piecing gives you great sharp points! 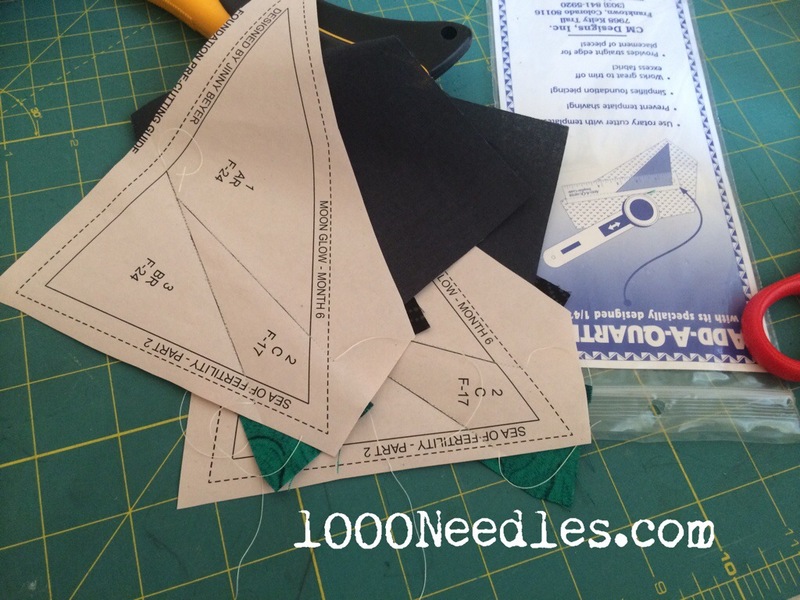 Then we sewed them all together. 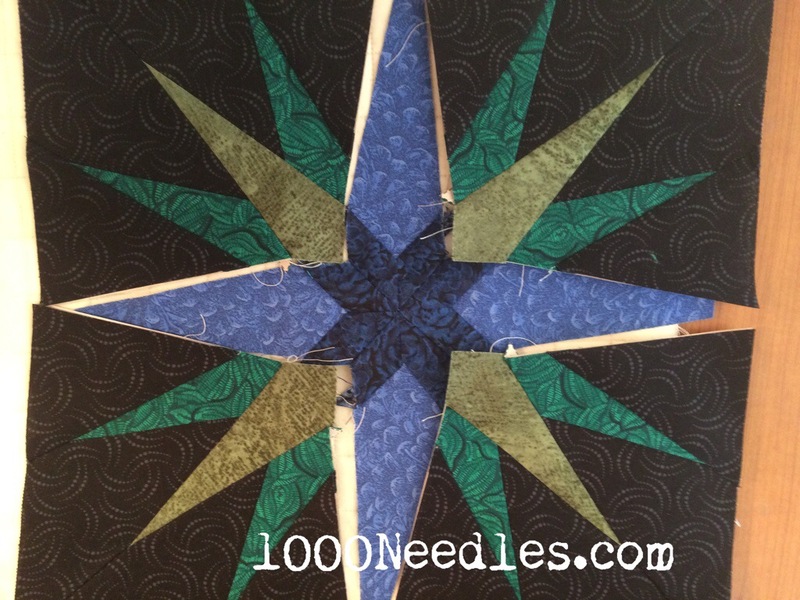 Where the olive green meets the darker blue is another Y-Seam. The Y-Seams give me problems and you can see how the center puckers. Here’s a close up of the finished center and most of the points are pretty good. I’ve got one spot really bad but the rest are pretty close. You can see the puckers better. I’m hoping they quilt out. 🙂 And if not, c’est la vie. I’m happy with how much I’m learning. 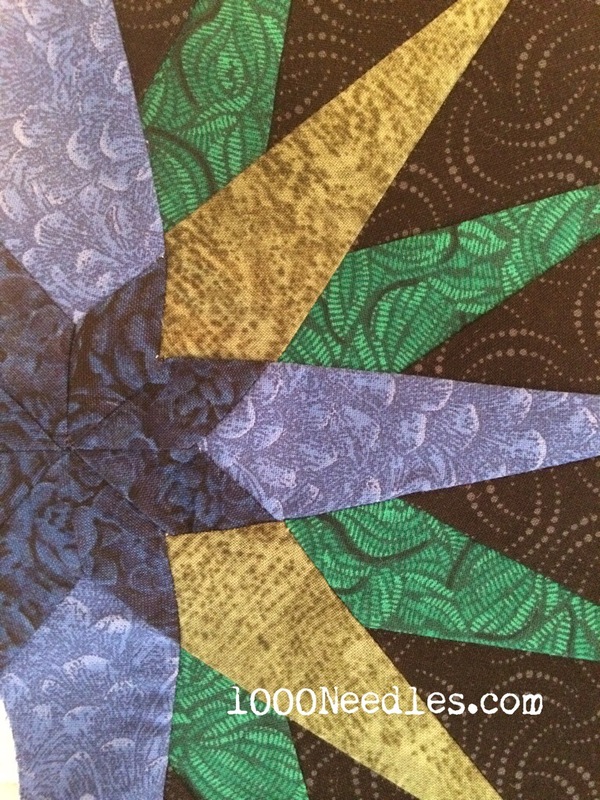 I wish I took this BOM as part of a class though to be able to get more tips on how to get these Y-Seams done right. 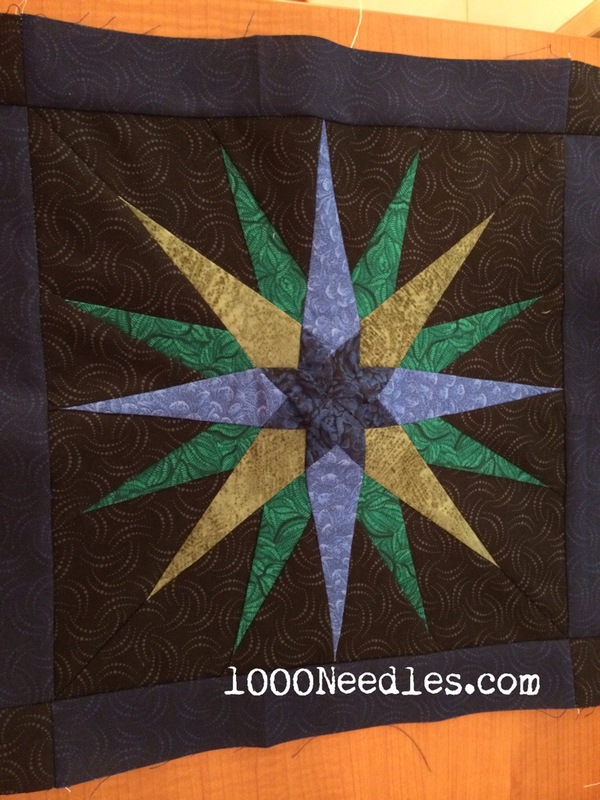 It’s a beautiful star, and I’m surprised the whole thing wasn’t paper-pieced. I am struggling so much with block number 6. I made it once and am not happy with how bulky it is, I am attempting a second go at it, if it isn’t better, it is what it is. 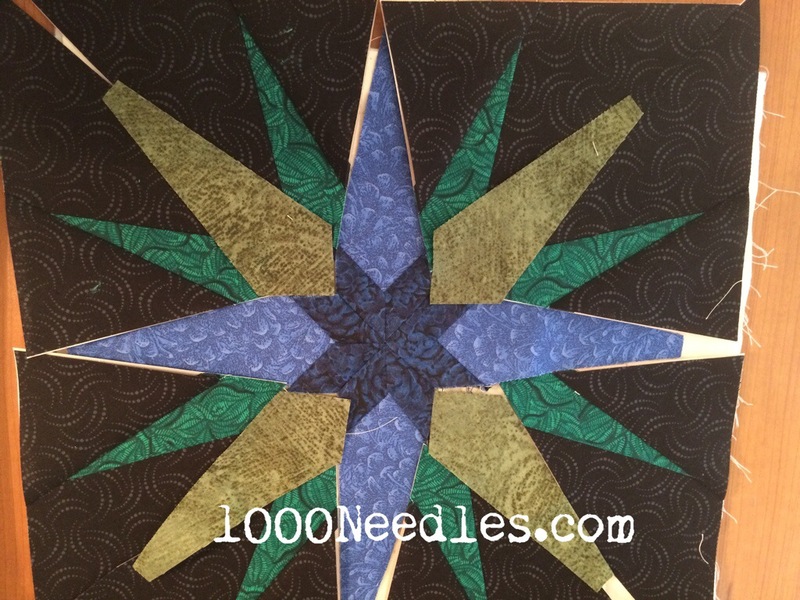 This quilt has been a nightmare! Way more complicated than what I was ready for, but I will not back down!! Keep at it! I’ve got the quilt on my bed and I do not even notice the puckers. In fact, I forgot about them until I reread this post!